The Vowels write good rock songs, good power-pop nuggets. But, the thing holding me back from getting into this album is vocals that sound, well, not quite right. 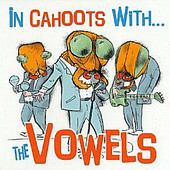 They're too flat, too lifeless for the energetic, hook-laden songs The Vowels create on their latest, In Cahoots With.... Sure, the music is great; from in the pocket drumming to guitars that spit out the rock 'n' roll mayhem. The vocals, though, I can't get past them, and it leads me to grow quickly frustrated and tired of the album. I tried, I just couldn't get into this. If only they had a voice to match the melodic and rock power of the music. I'll give it a C-.